I reached Mangalore a little late, at about 8:30 AM. The house appeared hauntingly silent; kitchen was abnormally clean like it had not smelled the Indian spices for ages and refrigerator stood strangely empty. Yes, Mom isn’t home. She is in LA with my sister Anu. And my father is alone and gets food from a near by mess. This day went by nicely. Tired from the jerky road trip, I took a nice nap. Later at 8:30 PM, after dinner, I met Vasu at Suratkal bus stop. Our bus to Ernakulam / Cochin from Mangalore KSRTC bus stop was at 10:00PM. We reached Lalbagh at around 9:00 PM and my eyes quickly turned towards the Pabas Ice-cream parlor. How could I be in Mangalore and not taste the Special ice cream? Yes, Ideal and Pabas ice cream parlors in Mangalore offer the best ice creams in the world. They are simply different and great. I haven’t tasted such excellent ice cream anywhere else, until now. And Ideals ice cream parlor is three storied and offers more than 60 varieties of ice creams. So after treating ourselves with Banana split ice cream we walked to the bus stand to find the bus already waiting for us. We reached Cochin or Kochi or Ernakulam at 9:00 AM. My father had lived in Ernakulam for 8 years. My mother and sisters have also lived there for some time before I was born. So, I have heard a lot of stories from them about the place and thus when Vasu mentioned about a trip to Guruvayur temple, I wanted to include Ernakulam in it. We checked into some fairly cheap lodge and got ready within half an hour. After our breakfast, I spoke to the manager and collected some information about the ferry that takes us to different islands near Kochi. We did have some trouble finding the KSTDC tourism, but a teashop owner who had some funny name for his shop, which meant “Mayor Of London” or something like that he said, helped us find another agency. We booked tickets, but the tour would begin only at 2:00PM he said. So he helped us find an Auto, which could take us to the Hill Palace and Chottinakara Temple. We went to Chottinakara temple first which is about 10 KM from Ernakulum. There are two temples, one old and the other new. We could visit the old one but the new temple was closed. Some interesting things to notice was dolls being nailed to a banyan tree. People suffering from mental illness or as people say – affected by evil spirits, are said to be cured here. The entire tree was covered with scary little dolls. We then moved to the Hill palace, which now is a museum. There isn’t anything noticeable about the palace architecture. But the collection of antiques and jewelry is worth watching. A huge dinosaur statue behind the palace, took us by surprise. 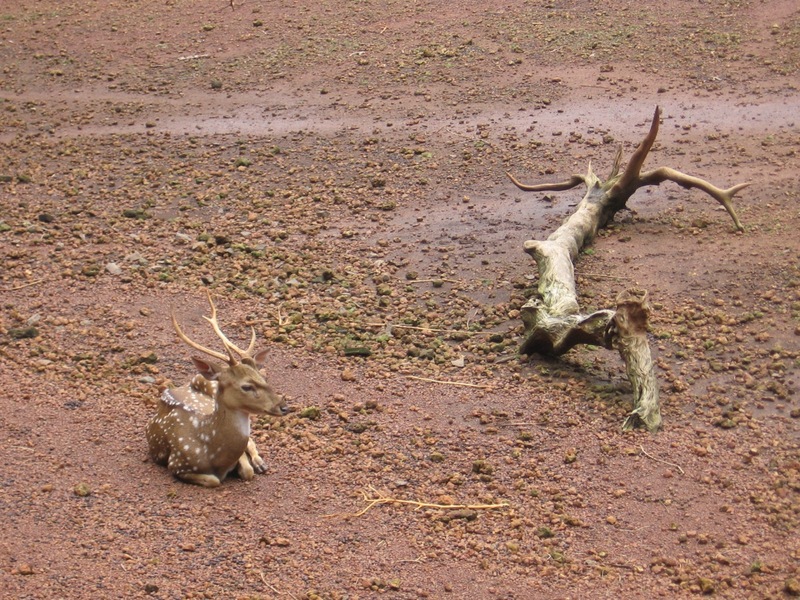 Deer park is fairly well maintained. This deer was not interested on feasting over the freshly brought lunch instead, relaxed watching other deers crowd in for the food. After lunch, the Auto driver dropped us back to the place where we would begin our ferry ride. The ferry was well crowded. We were first taken to the Wellington Island. 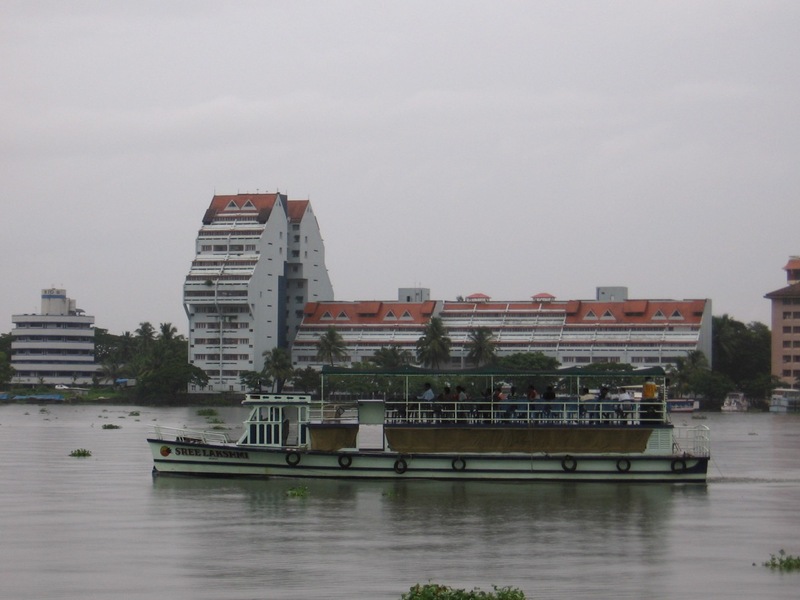 On the way, the naval base and Ernakulam cosmopolitan city with its multi-storied buildings and apartments formed an excellent backdrop. At the island, we first visited the Matancherri palace, which again is a museum now. 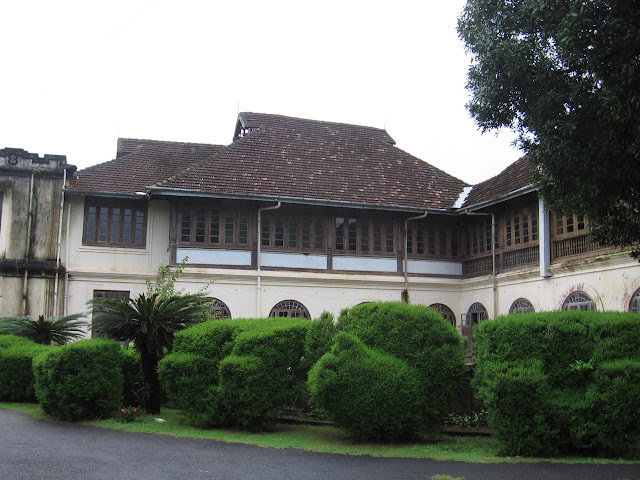 The palace was gifted by the Portuguese to the king of Cochin for allowing smooth operation of trade. Again, the palace is not very impressive if compared to Bangalore or Mysore palaces. But the Kerala mural paintings are something to look out far. The walls are painted with stories from Hindu epics. But sadly most of the paintings have faded off due to lack of proper maintenance. A temple within the palace premises was closed at the time we were there. But it looked very impressive from outside. We then walked to the Synagogue. Synagogues are Jewish temples and there are about a dozen families of Jews who stayed back in Cochin. Well I was not allowed to enter the synagogue because I was wearing short pants. So, I had to rent out a pant for just RS 10. (Which are readily available at a near by shop) Even though I could not clearly make out how the prayer is performed, it was nice to see a Synagogue with a brass pulpit at the center & blue painted tile flooring. After this we took off again and viewed the Chinese fishing nets that are being used till date by the fishermen. There is a small island called Balghatty, a palace there has been converted into a 3 star hotel run by the government. We did not actually stop there, but took a glance at it during our return. We reached back to Ernakulam by 5:20 PM. Rushed back to the hotel, freshened up and took off for another expedition. I wanted to watch Kathakali – Folk dance of Kerala. 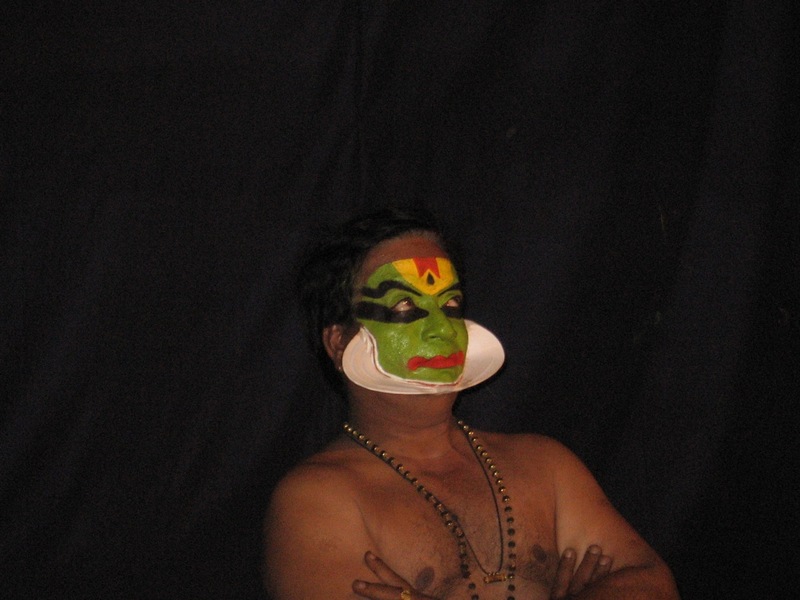 When enquired with the Auto driver, he had mention about this place where they conducted Kathakali shows daily. It is called “See India Foundation” and is located near Ernakulam railway station. We found out that it was at a walkable distance from our hotel. On our way, we also stopped by a “Darbar hall”. 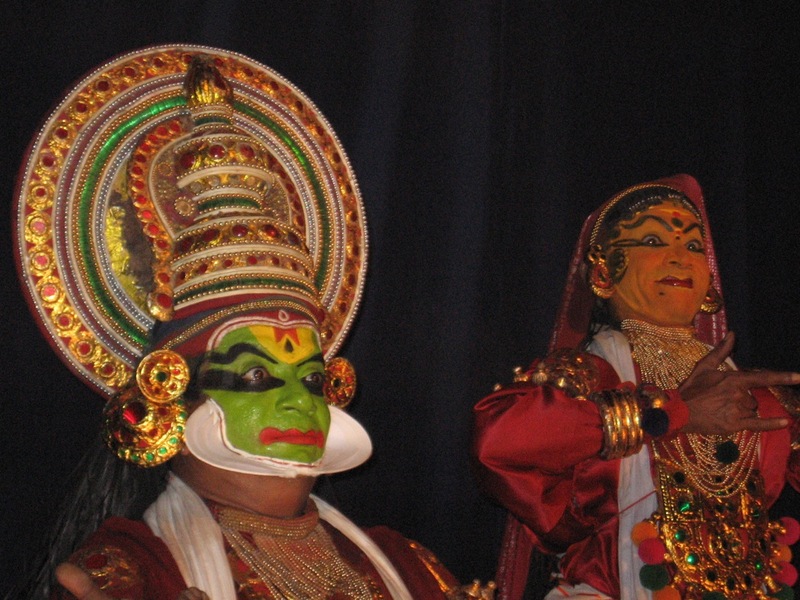 An exhibition of Kerala mural paintings by three girls was being held there. The paintings were reasonably cheap and both Vasu and I liked them. We enquired with the girls about how to get them shipped to Mangalore and other information if we needed to order some. After a quick talk with them we rushed to the Katahakali show. Now, this was something that I had least expected. When we reached there, the show had already begun. The director was speaking about how the dance evolved. And two artists were applying makeup on their face, right there in front of us. The director gave a very nice explanation of the dance forms, steps, expressions, paints used and stories enacted. The room was filled with foreign tourists. The director first told us the story and then the actors enacted the same. It was much easier to understand the performance after the story had been told. 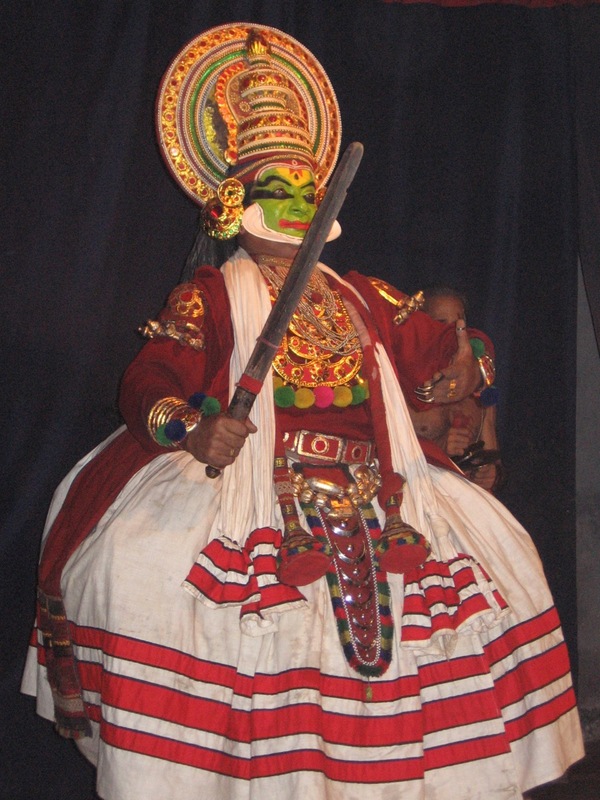 Because Kathakali actors do not speak, story is conveyed through only expressions. Director had clearly explained to us different symbols and expressions before the play began. All together it was a spectacular experience. Tired from the day’s adventure we retired to bed soon after dinner. We got up at 5:00 Am and in half an hour we were ready to check out of the hotel. We walked to the railway station. Our train to Guruvayur left Ernakulam at 6:00 Am. It’s a passenger train and I am not sure if the bus takes lesser time. Well this train took 2.5 hours to reach Guruvayur. But unlike previous trains that I have been in, this was almost empty. I enjoyed the journey as the trained twisted and turned between the palm groves, green fields & rubber plantations. It felt like I was somewhere close to home. After reaching Guruvayur, we took an Auto to the temple which is not more than a kilometer from the station. Now, here we had to change to “Panche / Veshti” (A traditional dress for men) to enter the temple. So we kept our luggage and chappals in the cloak room and stood in a queue that was 10 times longer than the train that we had just traveled in. The temple was over crowded and after 3 hours of waiting in the queue, we finally got to see the main deity. Bala Krishna idol, spectacularly painted mural paintings, excellent carvings on stone within the main shrine made all that waiting seem negligible. 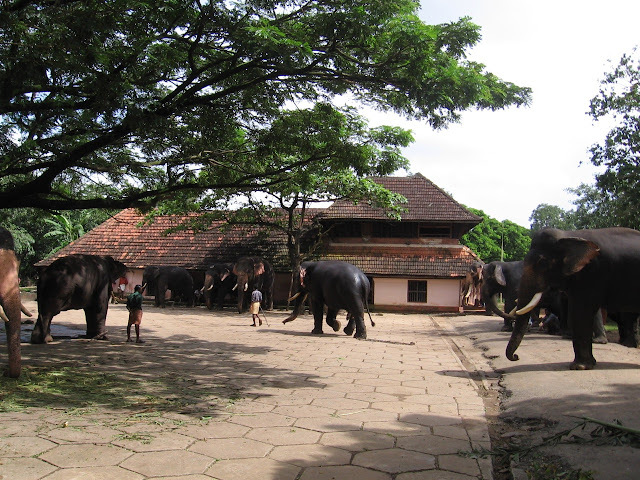 We then took another auto to Annekotte, this is about 4 KM from temple and it houses more than 60 elephants. Now this again was an unexpected exciting part of the trip. It was awesome experience to watch one dedicated mahout for each elephant. They trained it well. Mostly when spoken in Malayalam they clearly understood the instructions. It’s worth spending an entire day there watching how the elephants are trained, fed; take bath and how some misbehave too. 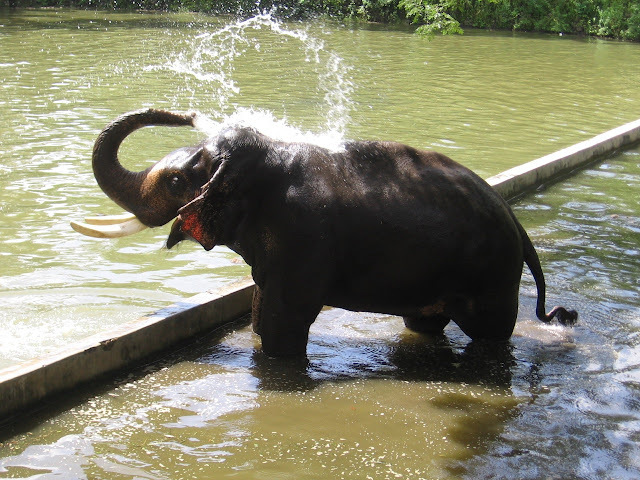 Yes there was this one elephant who denied coming out of the pool even if the mahout ordered it to. The elephant kept splashing water showing its disagreement. He finally had to beg her to return. The whole episode was very funny and nice to watch. They all assembled for lunch near the main building. This month full was a rest period for the elephants when they would be fed and medicated. By then it was very late, so we decided to move. We took a bus to Trissur. After enquiring about the railway and KSRTC Bus timings none suited our plan. So, we finally booked a private bus which not only would reach Mangalore early but also would drop us till Suratkal. After that we took an auto to state museum and palace museum in Trissur. Both were closed because Monday is a holiday in most places. 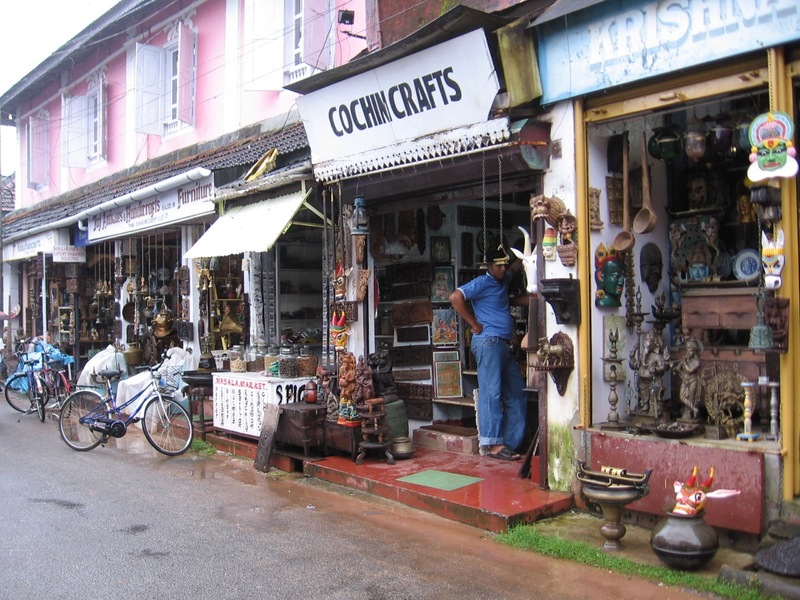 So if you are planning a visit to some historic sites of Kerala, keep Mondays out. 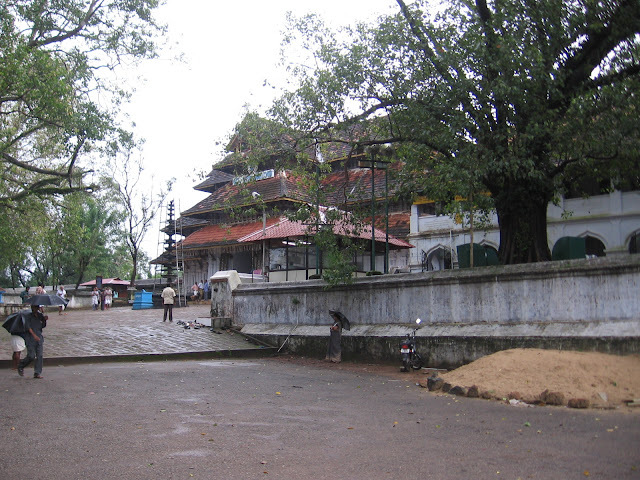 We then visited Vadakunathan Temple located in the heart of the city. The temple architecture is spectacular. If you are anywhere near Trissur, definitely do not miss this temple. It houses many small temples within the premises, main being the Shiva temple at the center. The temples are hexagon shaped build mostly of wood and a spectacular bronze roof. We then walked past the busy streets of Trissur, yet enjoying the crowd. A cathedral near the city built in 1930’s is also good place to visit. To kill time, we continued walking on the streets of the city, bought some Kerala special food items like, Banana chips and my favorite Shakarvati. Had a good dinner at some restaurant and then returned to the bus stop. We left trissur by 10:00 PM, totally exhausted by the long day. I reached home at 7:30 AM. My sister Anu called from LA to give me the good news that she had given birth to a baby boy. After a small nap and breakfast, father and I left to Padil; to my uncle’s house to attend a pooja. It was nice talking to cousins and relatives. After lunch, I took a bus to Pollali. I have had strong faith in Pollali Rajarajeshwari Goddess since my college days. And if you haven’t been there or plan to be in Mangalore, do visit this temple. Three huge idols made of mud attract the devotees. People also say that it hides golden idols within them. The idols, people say were covered with mud once when the place was under threat of attack by some muslim rulers. I decided to add some more to the adventure, so I took a new route back to Suratkal through Bajpe. I had been through this road before too and this time it brought back the memories. Later I met my relative/friend/neighbor Harsha and we took a walk near the beach. How could I miss going to the beach during a trip home? It’s totally out of question. Well on our way, I was surprised to see 4 peacocks. Harsha told me that they are always there. Two ships in the beach were completely lit up. They celebrated Independence Day by shooting out spectacular fireworks. This was an unexpected treat again. I returned back home and packed my bags for yet another journey, back to Bangalore. At 6:45 AM, when I had to be near Bangalore, I was still in Sakleshpura Ghat; stuck in a traffic jam all night. At dawn, the traffic jam was cleared and we finally got rolling again. It was again an amazing view; hills covered with mist. There is something mysterious about the things covered in mist or snow. They hide and unhide nature’s beauty in an appreciable manner. I enjoyed my trip back and called my colleagues to let them know that I was not coming to office. I reached Bangalore at 1:00 PM. So this has been a wonderful long weekend for me, lot of experiences, lot of fun, lot of learnings, more pictures and of course much more traveling. And the icecream is always best at Pabbas. Its totally diff compared to the Corner House stuff. Pics look awesome. Especially the one with elephant sprinkling water over itself. Tell me all about mists... last time I went to Swiss, right after the tourbus got off a tunnel from Germany; it was like a heaven on Earth... with mist and clouds making the city mystifying yet very beautiful. Ah, I envy you for being on such a nice trip. Wow! Sounds like you had a super trip. I will be back for more reading. I read about half for now. The pictures are great. 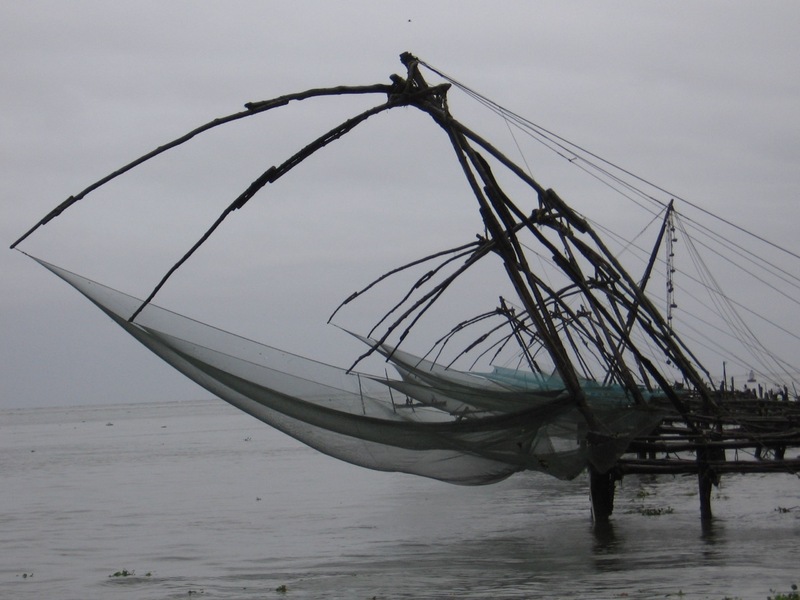 I specially like the one with the fishing nets. For a person who likes to travel and dig the hidden values of a place, these articles help a lot. Keep visiting places and keep putting them here. And having lived 5 years in Mangalore, I had never visited pollali too. My dear Rao, I find it quite difficult to stop reading your travelogues once I start! Excellent write up once again. I remember quite clearly instructing you to hold down the fort and not move till i got back to Bangalore! Hahaha! But, if we continue to get such well written stories of your travels, then I should be condemned for obstruction of joy to myself and to the other readers of your pages. Keep those quills sharp, and let the ink continue to flow! Thank you. @Harsha - Yep It is long. For a traveler every small issue neds to be recorded because they are so special and emjoyed, but I have tried my best to keep it short. Pabbas and Ideals...no one can beat it! @ Reborn - Thanks...yes many have notheard of annekote. Well i have bought this excellent tour guide of India from DK Publication...its very detailed and good. covers all minute details of any place. I am sure you will enjoy a trip to ndia if you plan to...you will have a different expereience in each and every part of the country...in every state perhaps. @Travel Plaza - Thanks...Did you visit these parts of India during your trip? @Srik - Thanks..Welcome to my blog. Well its time for you to start off with some of your experience there. Must be having fun in US too...Well for the trips here...dono worry , I have plenty of more places in my list...Will plan one after your return. Ajeya, Unfortunately, I've never visited any of these places. Our vacation is usually spent with family in B'lore and H'bad, most of the time. And we always go to Tirupati. Apart from that, during our last vacation, I took my kids to Mysore coz my older son had visited there when he was really young and wanted to go back for another visit. So u were in Guruvayur, is it?? Otherwise we would've bumped into each other for sure.. :)..
i was their all time patron. chocolate dad was my BIG fav, gadbad..
man, i am waiting to come back. and pabbas has been the choicest place for the reunions. SG- Yep...Waiting to hear about your Kerala Trip.